To me when I'm on travels everyday is the picture above. 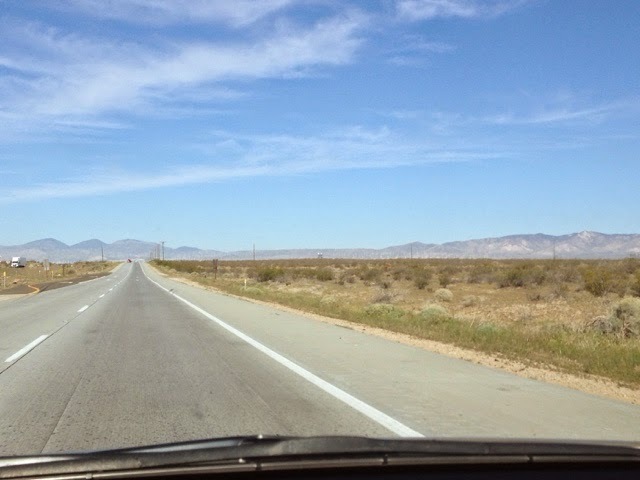 A vast open road. This was actually what my trip on I40 when the sun came up today. It's true that I work within a travel concept. When I left Salt Lake City, Utah I knew I needed to be in Monterey, CA for this Tuesday afternoon. I am not kidding when I say I didn't know where I was going until the morning I checked out of the hotel. I look at the weather and my options and I pick one and go. I had no plan on completing the 5 National Parks in Utah at that time. I had actually thought about heading into Idaho them back to CA but I decided I wanted tee shirt and shorts so I went south. So this morning I knew I wanted to be in central CA today and decided to go to Yosemite National Park. I did hold back coming this way until today due to weekend crowds at state, county. and federal parks, believing Sunday night would be easier to get a last minute camping spot. 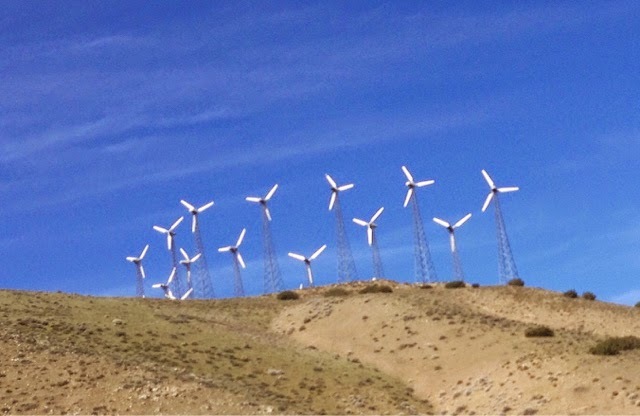 Group of electrical power windmills on I 40 between Barstow, CA and Bakersfield, CA. Well, it was a 370 mile drive to get to Yosemite by 3:00 pm and I got one of the last 5 camping spots. The only reason there were any open spots was because of cancelations. My backup plan would have been a county campground I stayed at last year 35 miles outside the park. Folks, it is crowded here like Zion & Arches NP's. I was lucky to get a spot. Like the other parks there are many people visiting from other countries. The reason I tell you about my lack of planning is that when I was a program manager and Fire Chief I lived to a plan every day. Although, I did like the razzle dazzle of the change in plans when it occurred. One example was when I was flying to Tokyo with my boss from Kennedy Airport in New York and we took off and sucked birds into an engine on takeoff and had to dump our full tanks of fuel into the Atlantic Ocean to come back in for an emergency landing. I was already working alternatives in my mind on how we were going to get to Tokyo for our meeting. I had my boss go stand in line for the United Agent for the flight we were on and I called JAL. I got a flight for us on JAL and myboss was still standing in line. We later found out United as booking people on the same JAL flight and it sold out after I got seats for us. With my bosses place in the United line we wouldn't have made it our meeting. This was my world. Plan execute replan, etc. Last year during my 2014 Travels I found contentment in not having to keep all this detail. Basically it isn't necessary when you only have yourself to contend with, or should I say I am the only person to disappoint. So I am asked, or people make comment, many times on the trip, "It must be nice to wake up and do what you feel like doing./?" Well, yes it is, but it doesn't last for ever. I go home and responsibilities to home and others is part of my home life and I need to be more intent on planning. So, I'm not totally a free spirit, nor would I want to be, but when I'm solo I do and I will. I will not be covering Yosemite NP in this post as I will cover it in total tomorrow's blog. 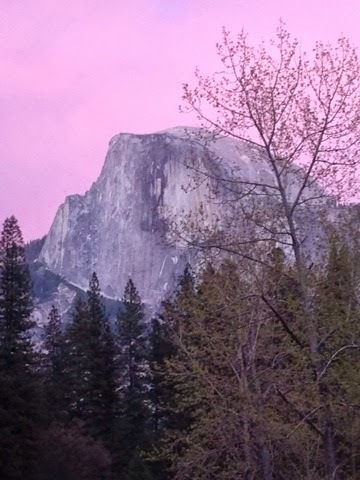 Here is my sunset on a mountain in Yosemite NP tonight. Amazing natural color! What a gift to have seen this. Right place and right time.